Into the Abyss is another accomplished, engrossing Werner Herzog documentary. It’s an exploration of the reasons why people kill. Herzog speaks with death row inmate Michael Perry, his accomplice, Jason Burkett, in the crime as well as those most closely affected. He also questions people about the validity, morality and overall effectiveness of the death penalty. 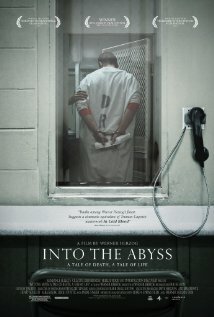 As an anti-death penalty film, Into the Abyss brings up some standard arguments from a former Death House officer and others. The strongest, most compelling and moving documentary about the death penalty is At the Death House Door. Texas kills so many inmates annually. Many states might have the death penalty but don’t really practice it. I can’t understand the reasoning behind it. It doesn’t deter someone from a crime and it also doesn’t bring the dead back. Ten years ago, two drug-addled teenagers killed a woman to take her car. And in the process they killed two other boys their own age. One sits on death row. The other has a life sentence. The ever inquisitive Herzog interviews law officials, career criminals and white trash for the most part. The erudite Cambridge audience I sat in a screening with laughed at much of what these people said, to my dismay—“I can’t read”—“My father’s in prison too.” They talk about guns with such bravado, knowledge and comfort that it’s disturbing. Then again, it’s Texas where I think infants learn to shoot before they learn to read. The provocative Into the Abyss reveals quite a bit and will engage you throughout the film. This entry was posted on November 19, 2011, 00:58 and is filed under Film. You can follow any responses to this entry through RSS 2.0. Both comments and pings are currently closed.